There used to be a time when an innocent game of tug of war involved two teams of people pulling their respective side of a rope and attempting to pull the other team over a certain threshold. 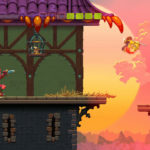 Nidhogg 2 has no rope but does include a giant worm and sharp objects. The game is now available on Nintendo Switch and brings with it new levels, more weapons, new fashion options to look good while being eaten by a giant worm. 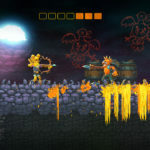 Nidhogg 2 offers various game modes including 1 on 1 combat versus AI or another player as well as online tournaments. The game was previously available on PC (Win/Mac), PS4, and Xbox One. You can find our review of the game for PC right here.